The Association for Church Archives of Ireland has produced a calendar featuring twelve photographs from Irish religious archives. The calendar has been produced in order to raise much needed funds, so that the ACAI can continue to host workshops, information and training days, lectures, etc for church archivists in Ireland. The calendar costs €5 to buy, and will be on sale at the ACAI’s AGM on Saturday 12th May, in All Hallows College, Dublin 9. If you would like to order a calendar, please contact us for an order form. The Association for Church Archives of Ireland will hold their AGM in the Margaret Aylward Centre, Glasnevin Hill, Dublin 9 on Saturday, 9th May 2015. Elections – all of the committee are happy to stay on for another term of office as per the constitution. However, if any member wishes to put their name forward for a position on the committee, an election can be held. Please forward your names to Brian Kirby by 1 May. Creating a policy framework for an archives service: some key considerations. Policies in the Irish Jesuit Archives: the proof is in the implementation. Old Fashioned? The Jesuit project of a commemorative calendar and a fulltext publication. Annual Membership Fee payable on the day: €20. Please send cheques in advance of the AGM, payable to the ACAI and sent to Clare Brophy, Provincial Archivist, Franciscan Friary, Merchant’s Quay, Dublin 8. (Those who wish to pay on the day may do so in cash or by cheque). The ACAI seminar, ‘Future of Church Archives: Opportunity or Crisis?’, is taking place next Saturday, 28th February in St. Patrick’s College, Drumcondra, Dublin 9. The full agenda for the day can be found here. DATE: Saturday, 28th February 2015. Attendees should arrive by 10.45am for registration, at which tea and coffee will be served. VENUE: Lecture Hall, New Library Building, St. Patrick’s College, Drumcondra, Dublin 9. Registration has now opened for our one-day seminar ‘The Future of Church Archives: Opportunity or Crisis’ which will be held in St. Patrick’s College, Drumcondra, Dublin 9 on Saturday, 28 February, 2015. Interested parties are encouraged to register for this event as places are limited and we expect significant demand for places. The ACAI are delighted to announce that we will be hosting a one-day seminar entitled ‘The Future of Church Archives: Opportunity or Crisis’ on Saturday, 28 February, 2015 at St. Patrick’s College, Drumcondra, Dublin 9. 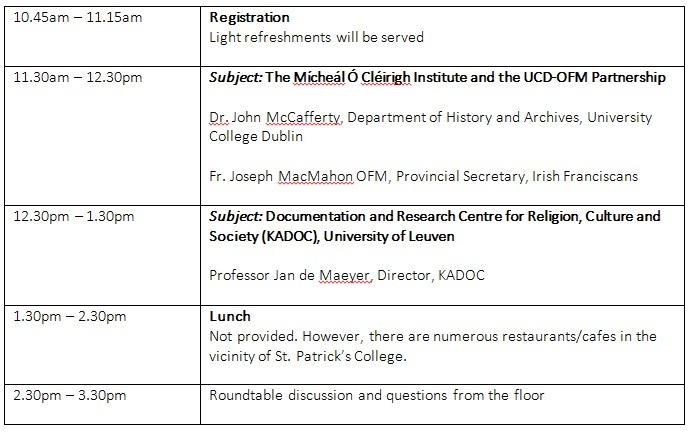 It is hoped that this event will open up a discussion on the future of church archival collections in Ireland. Interested parties are encouraged to register for this event as places are limited and we expect significant demand for places. The academic journal Verbum et Ecclesia recently published an article regarding religious archives in South Africa. The article, entitled ‘Collection stewardship constrained by resources: The management of religious archives in Pietermaritzburg, KwaZulu-Natal region’, discusses the types of records held in South African religious archives and examines related issues such as preservation, archival storage, disaster prevention, environmental conditions, digitisation and security. Interestingly, the author of the study, Francis Garaba, recommended the establishment of a religious archives group in order for the “voice of ecclesiastical archives to resonate across South Africa” and to foster “greater coordination and networking amongst the archival repositories”. It can be read (free of charge) here: Verbum et Ecclesia. The Catholic Historical Society of Ireland and the Irish Jesuit Province are hosting a two-day conference in Belvedere College, Dublin 1, on 19-20 September, to mark the bi-centenary of the Restoration of the Jesuits in Ireland (1814). Themes treated will include the Jesuits and: political violence; the Irish language; the Easter Rising; World War I; the labour movement; the sciences; art and architecture. All are welcome, it is free to attend and the programme starts at 2pm, Friday, 19 September 2014. The second day of the conference, Saturday 20 September, the programme will begin at 09:30 and continue until 17:00. Vera Orschel of the Rome Archival Project – “Uniting the dispersed members”: Jesuit Communications and the Irish annual letters (1604-1675). The book Irish Jesuit Chaplains in the First World War will be launched at the conference on Friday, 19 September 2014 by Roisin Duffy, RTÉ Producer, Fr Browne’s Forgotten War. The ACAI Autumn visit will be to the Methodist Historical Society of Ireland, Edgehill College, Belfast and will take place on Saturday, 11th October 2014 at 10.30am. The tour is kindly being facilitated by Robin Roddy, Archivist, and his colleague, Jennifer Stutt. More information about the Methodist Historical Society and their Library and Archives can be found on their website: http://www.methodisthistoryireland.org. It is expected that members will make their own way to Belfast. Those wishing to participate should contact the ACAI secretary at capuchinarchives@gmail.com as we will need to know the numbers in advance. It has been announced that the Catholic Record Society Conference will be held at Downing College, Cambridge, 28-30 July 2014. Registration is open until 1 July 2014. E-mail catholicrecordsociety@gmail.com for a booking form or with any further enquiries. Interestingly, for those unable to attend, the conference will also be live tweeted using the hashtag #crs2014. CONFERENCE TO FINISH NO LATER THAN 5 P.M. for trains back home. The excursion will take place on Wednesday 30 July. This year the excursion will be to Ely Cathedral, Cambridgeshire. Full details are available on the website. Dr Francis Young will lead the excursion. There will be a separate cost for transport and a donation for entrance which will be payable on the day. Please indicate on the booking form whether you wish to attend the excursion. A limited number of bursaries are available to postgraduate students and bona fide scholars. Further details are available via the website. If you wish to apply for a bursary please contact the conference director for an informal discussion or fill in the online application on the website. All applications must be received by 1 July 2013. Successful applicants are asked to deliver a Short Communication (c. 2000 words/15 – 20 minute delivery) on the subject matter of their research. Membership of the CRS is not necessary to apply for a bursary.